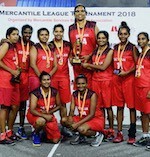 Seylan Bank's women basketball team clinched the women's A Division level 2 title at the 28th mercantile basketball league championship which concluded recently at the Henry Pedris Sports Complex in Colombo. Organised by the Mercantile Association of Sri Lanka, Seylan Bank faced off with Nations Trust Bank in a gruelling game of Women's Basketball. Seylan triumphed over their opponents by defeating them by 51-24 points. A total number of fifty two teams, both men and women-the largest in the history of MBA and a total of 123 matches took place at both venues in this year's edition. Commenting on the achievement Amaya Kalpani, Captain of the team said 'It's an extraordinary effort by the team and as the Captain, I have immense pride to lead such talented athletes to continuous triumphs. This victory is a testament of our hard work, perseverance and dedication towards the sport. We have been empowered by Seylan Bank that provide us with a flexibility and belief therefore, bringing glory to our brand makes this win that much sweeter.' Benika Thalagala bagged the most valuable player Award whilst the Player of the final was conferred to Kunchana Wijesiriwardena. 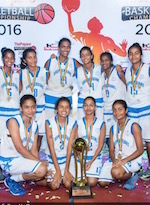 Seylan's Women Basketball team comprised of Amaya Kalpani (Captain), Jayaliya Kumari, Benika Thalagala, Gaya Jayaweera, Tharjini SIvalingam, Kunchana Wijesiriwardena, Nethmi Herath, Kamalene Mills, Greshani Fernando, Prabashi Mahawatta.